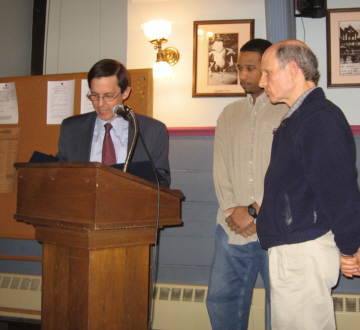 "Be About Peace Day unites two towns in peace"
South Orange Village President Douglas Newman reads a Proclamation declaring March 29, 2008 as Be About Peace Day in South Orange, as South Mountain Peace Action members Nkosi Anderson and Paul Surovell look on. The Maplewood Township Committee passed a similar Proclamation earlier. Be About Peace Day is an annual intergenerational event held in Maplewood and South Orange, NJ, featuring arts and crafts, music and discussion around the theme of peace. This year, for the second time, the event has been recognized by both town councils, in proclamations designating March 29, 2008, as Be About Peace Day in Maplewood and South Orange. We haven't been able to find another example of a US town declaring a day for peace. The story of how this came to pass in Maplewood and South Orange centers around the evolution of the event sponsor, South Mountain Peace Action, which took the issue of peace from the margins of the community to the mainstream. The process began with a boy's design of a lawn sign and a meeting with a local Congressman. In January 2003, 10-year-old Jackson Roberts of Maplewood created a poster with the words "Be About Peace" against a gray background of "WarWarWar..." The poster was converted into a lawn sign that has been adopted by more than 1,200 homes in Maplewood and South Orange. The "Be About Peace" lawn sign has made peace advocacy part of the landscape of Maplewood and South Orange. Its positive, non-confrontational message has helped define the message and approach of South Mountain Peace Action, the sign's distributor. As South Mountain Peace Action member Beth Boily likes to say, "we're so grassroots that our message literally emerges from the grass of our community." A little more than a year after the first Be About Peace lawn sign was installed, South Mountain Peace Action organized a delegation to present a petition to South Orange’s Congressman Bill Pascrell calling for him to speak out against the war in Iraq. During the discussion, the Congressman said that in Congress the antiwar movement had a radical, anti-military image which made many in the House reluctant to be identified with it. The Congressman’s words accelerated efforts by South Mountain Peace Action to bring our programs into the mainstream, by focusing on realistic goals responsibly attained that would resonate with the community. -- We try to always frame issues in a positive manner. Our slogan, "Be About Peace," is a good example of this. On March 29th our evening forum will focus on the benefits of a Peace Economy not simply military budget cuts. -- We frame our calls for the US to end its military involvement in Iraq without using the words "now" or "immediate" in order to be as inclusive as possible. We take note that while a majority of Americans favor an end to our troop presence in Iraq, only about 20% support immediate withdrawal. -- We honor those who serve in the military and recognize their great sacrifice. Some of our members are veterans or belong to military families. -- We advocate full and fair disclosure by military recruiters and we support the rights of students and parents to opt out of the transfer of student information to military recruiters. However, we avoid the phrase "counter-recruitment," used by some in the peace movement, because it suggests opposition to military recruitment in general, which is not our mission. -- We participate in the local Memorial Day parade and carry our South Mountain Peace Action banner and American flags, but no political signs or slogans, which might distract from the purpose of the day, which is to honor the fallen. -- At our events and activities we invite all to join us in discussion including those who disagree with us. It is by engaging in conversation that we honor each other's thoughts and opinions. In December 2007 South Mountain Peace Action co-sponsored a meeting at Seton Hall with conservative columnist Paul Mulshine and Maplewood Mayor Fred Profeta on the topic, "Can Liberals and Conservatives Find Common Ground on the War?" We hope to follow up with further dialogue. -- We organize an annual event called Be About Peace Day, where politics takes second place to art, education and individual expression. A boy, his lawn sign, a conversation with a Congressman and a commitment to make peace a cause embraced by mainstream Americans are the stories behind the proclamations for a day of peace in Maplewood and South Orange, NJ. Be About Peace Day runs on March 29th from 1:00 pm to 5:00 pm at Maplewood Memorial Library on Baker Street and then reconvenes from 7:00 pm to 9:00 pm at the Ethical Culture Society at 516 Prospect Street in Maplewood. The afternoon session features arts and crafts for peace. The evening session features music and a public forum on "A Peace Economy and the 2008 Elections." We would love to see you there. Chris Black is a resident of South Orange and Beth Boily, Paul Surovell and Donna Welsh are residents of Maplewood. All four authors are members of South Mountain Peace Action and Surovell is the chairman. More information is available at South Mountain Peace Action's web site www.BeAboutPeace.com.